In response to the anxieties that result from being perpetually plugged in, many people have taken up crafty hobbies as a form of stress relief. Netflix even picked up Norwegian “Slow TV,” featuring live videos of people knitting, which are intended to be calming. 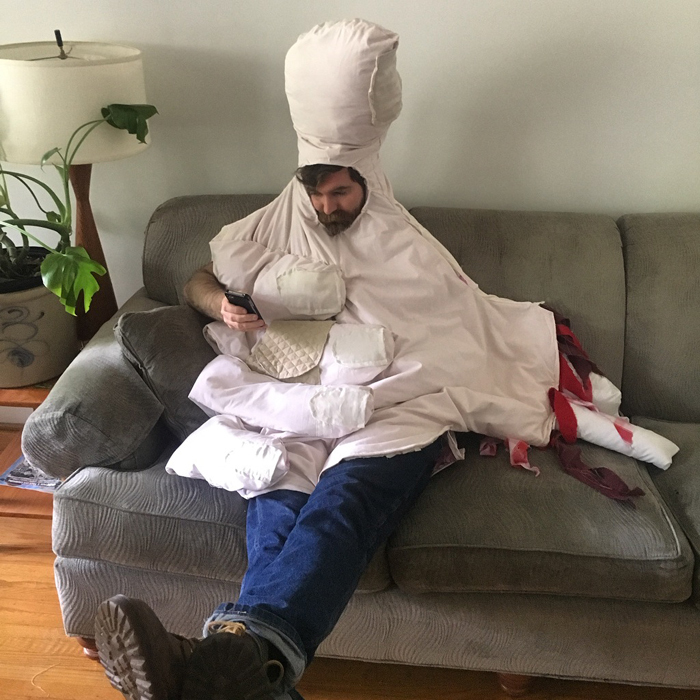 Recently, Salomone has made costumes that he calls “social media hazmat suits” from traditionally crafty processes in reference to the cycle of making crafts as stress relief from social media and then sharing those crafts on social media again. Concepts discussed by cultural analyst Sherry Turkle in her books Alone Together, and Reclaiming Conversation informs these costumes. During his time in the Project Space, Salomone will explore and stage socially engaging events like knitting circles to address contemporary psychological issues and experiment with documenting these events through various lens-based methods. Andrew Salomone has a MFA from The National University of Ireland. He has lectured on internet art practice at Parsons The New School, worked with a hacked knitting machine in the artist studios at The Museum of Arts and Design in NY, and written about art and technology for Make Magazine, The Creators Project, and Motherboard. Andrew will be talking about his work at 5:30 on Friday March 3, 2017. Project Space, Bookstore, and Gallery will be open until 9. Image-Crafting Hazmat Suit, Found Fabric, 2016. 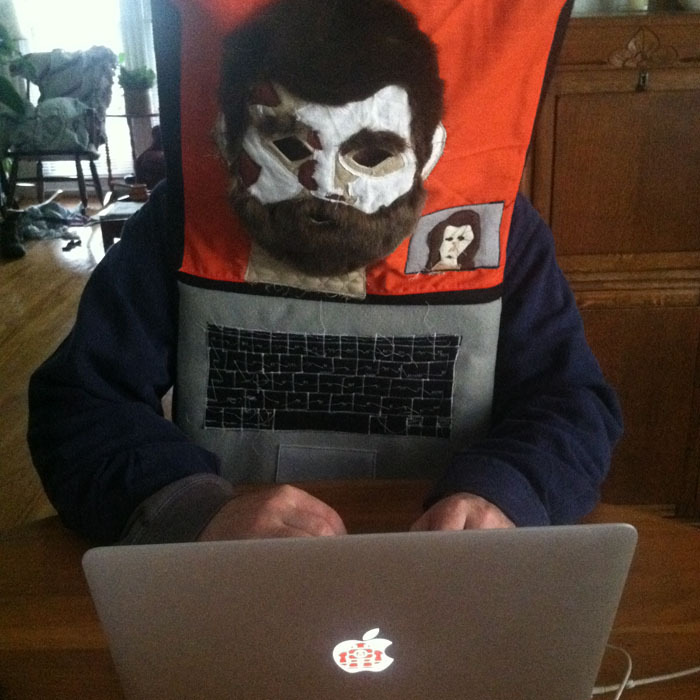 A suit designed to help the wearer navigate the perils of “image-crafting” on social media. Alone Together Cosplay Set, Felt, Found Fabric, 2016. 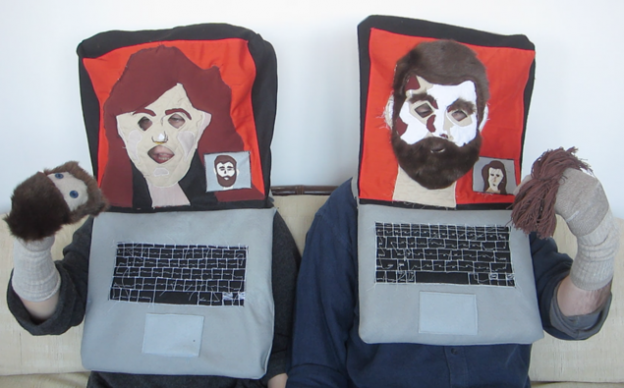 A set of masks and hand puppets designed to recreate an online experience, which cultural analyst Sherry Turkle calls being “alone together,” in an offline setting. Snapchat Sleep Mask, Fabric remnants, Thread, Shoe lace, Glue, 2016. 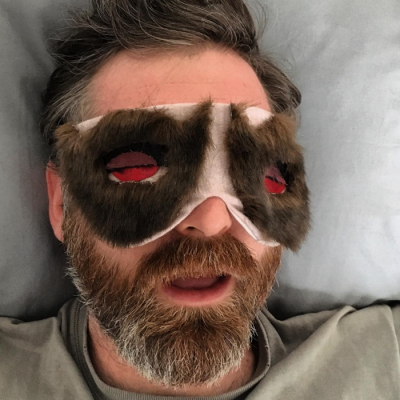 A function sleep mask that mimics the look of a snapchat filter. Machine Knit Identity-Preserving Balaclava, Photo with Snapchat Filter, 2016. 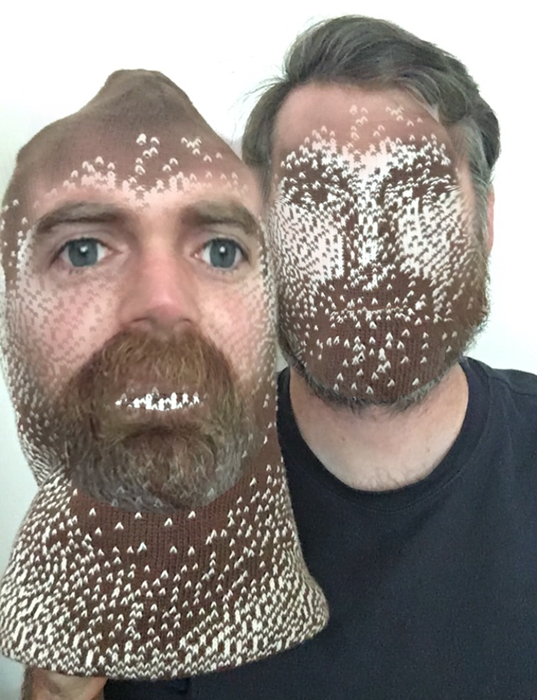 Machine knit version of images of the artist's head from different angles, visually manipulated by a snapchat filter.